Bloomberg has an optimistic look at Waymo’s plans to roll out its automated driving service. 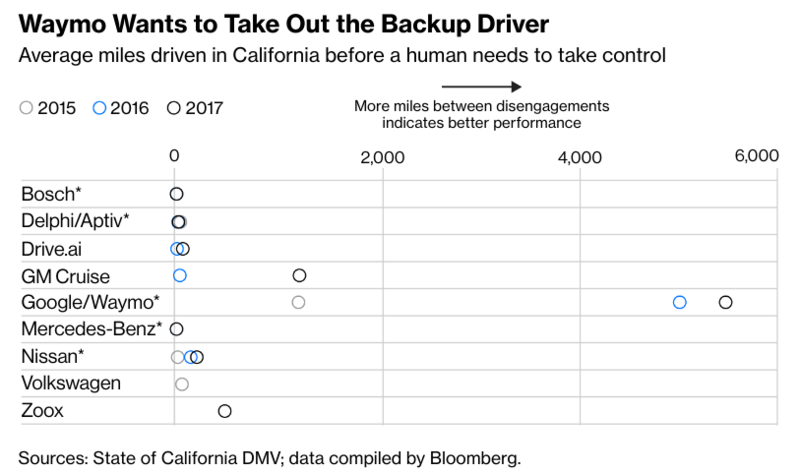 It includes the data, right, on how often the backup driver currently has to disengage the autonomous system. While Waymo clearly is doing better than the others shown, 6,000 miles strikes me as two orders of magnitude less than it needs to be. That said, that is a good measure, and it is headed the right direction. This obviously is the kind of effort that requires a significant focus on QA, so hiring a former NTSB chair makes sense. The Smithsonian Magazine has a longer article on how Waymo got to where it is. Disclaimer: I still am long Alphabet.